PaperDolls, a creative and collaborative aerial performance group, present “A Letter to Mina”, starring Alabaster dePlume, on 26th, 27th and 28th October, 2012. PaperDolls meet Bram Stoker in a Victorian inspired exploration of the female and the monstrous. Featuring performance and writing by Alabaster DePlume, an original score by the darlings of Dublin’s alternative music scene Estel, and a diverse display of talent and skill from Dublin’s rogue cabaret and subterranean theatre culture, PaperDolls performance company are creating a Gothic theatrical playground of ideas and physicality, for three nights only in the ever malleable D-Light Studios. An engrossing visual feast incorporates new writing, original music, aerial, circus skills, suspension and theatrics. 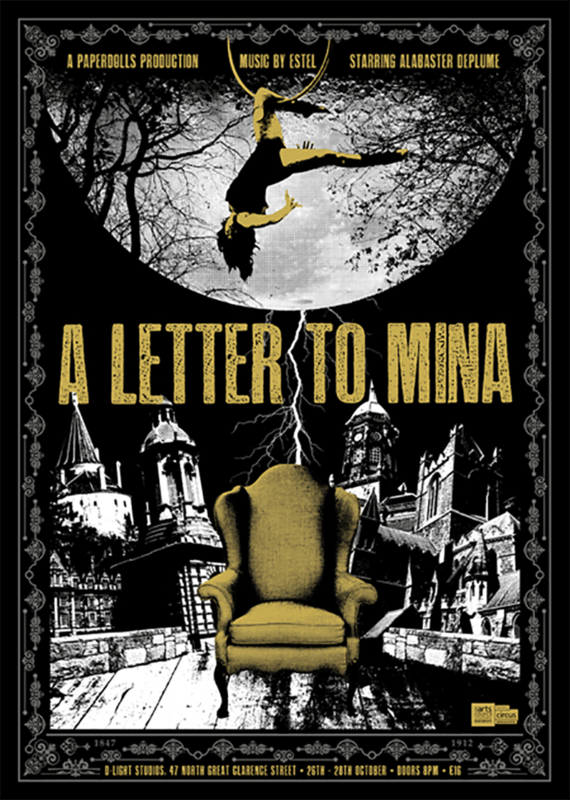 A Letter to Mina is an immersive and site specific performative adventure which oscillates between beauty and disgust.